Jake Ashkettle fields a pop up from the mound. Kyle Gammon dives back into first base on a pickoff attempt. Brayden Davis begins his swing on Sunday morning. Ethan Lauder extends on his delivery before throwing a pitch to the plate. Tyler Speas turns on a pitch and drives it into the outfield on Sunday morning. Speas had two big two-out hits that led to two RBI in a 9-7 victory over Ashland Post 76. In any sport, there are teams that have good spurts of play over a several day period. Then, there’s the type of play that the Portsmouth Post 23 baseball program put together throughout the four-day long Gene Bennett Baseball Classic, where Post 23, with moving parts all across its lineup at the beginning of the tournament, found a way to put together a lineup that consistently struck fear into the hearts of each of the opponents that it played. On Sunday morning and afternoon, the effective play that Post 23 put together throughout the course of the Gene Bennett Baseball Classic was omnipresent as Portsmouth jumped out to a 6-0 lead over Ashland Post 76, then matched six unanswered runs by Ashland en route to claiming a 9-7 victory. Post 23 then tallied up a incredible effort against a deeper unit in numbers in the Great Lakes Canadians by taking a 4-1 lead halfway through the Gene Bennett Baseball Classic Championship Game, but unfortunately, could not hold the point as four unanswered runs by the London, Ont. based program allowed the Canadians to take home the GBBC Championship via a 5-4 tally. For Matt Miller, however, the loss — as tough to stomach as it was — was overshadowed by an incredible effort that saw Post 23 outscore its opponents by a 54-24 margin. In the opening contest on Sunday, Post 23 picked up right where they left off in the GBBC Quarterfinals against the Ohio Force 17U by raking to the tune of six early runs in the GBBC Semis against Post 76. The third inning, especially, was a huge outburst for Post 23 as a leadoff single back up the middle by Tanner Kimbler, along with a stolen base, allowed Cole Dyer to use his opposite field power effectively by driving in Kimbler with Portsmouth’s first run on a standup double to right center field. 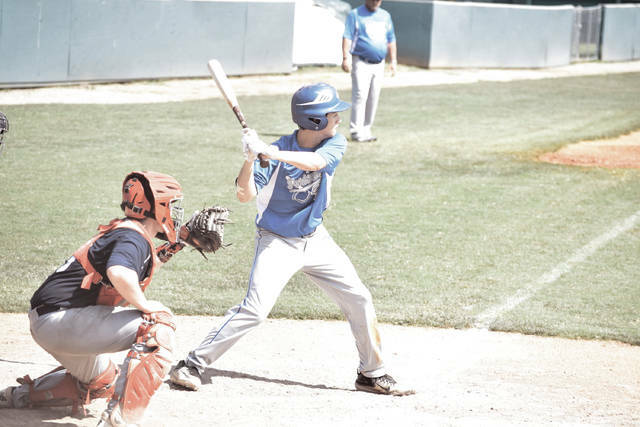 When Kyle Gammon followed with a single of his own to left field to score Dyer — and advanced to second base on the throw home — Tyler Speas followed two batters later by adding in a critical double of his own down the left field line to score Gammon. Two Post 76 errors then allowed Speas to score, and in a blink of an eye. Post 23 had obtained a 4-0 advantage. The spurt, however, only continued in the fourth inning. Since Post 23 batted around, Kimbler got to lead off the top half of the next frame, as well, and put more respect on his name with another hard-hit single back up the middle. Dyer added a single two batters later, and an error then allowed Kimbler to score as Dyer and Gammon moved into scoring position. Then, following an Ethan Lauder walk, Speas came up big again with his second two-out RBI base knock in as many innings to give Post 23 a 6-0 advantage. As the game wore on, however, pitching depth became an issue despite Jake Ashkettle’s workmanlike efforts on the hill. A single by Post 76’s Cameron Marushi and a double by Richie Hall was followed by an RBI single from Zach Greene, and an error, along with three walks and a hit-by-pitch, allowed Post 76 to close within 6-4 after four innings of work. In the fifth frame, a perfectly placed bunt single by Justin Manning and a walk by Hall allowed C.J. Fairchild to drive both runners home, as his two-RBI double down the left field line tied the score. “Jake gave us everything that he had those first five innings, and I could tell that he was getting a little gassed,” Miller said. “I was just saying, ‘Let’s try to get through this one.’ He threw the ball well. We had some uncharacteristic mistakes at times. The first game (with Post 76) was a struggle. We jumped ahead, then let Post 76 back in it, and it went back and forth. When singles by Dyer and Gammon, along with a pair of errors, allowed Post 23 to move back in front, Post 76 matched the output as consecutive singles by Nick Eastham, Scott Busch, and Collier Wireman allowed Manning to drive in Stevens and knot the score at seven apiece through six frames of work. Post 23, however, never lost composure. In the seventh frame, Reid Shultz, who pinch-hit for Jared Morrow, came on and laced an effective leadoff single to left field, which allowed Seth Nichols to drop down an effective sacrifice bunt. 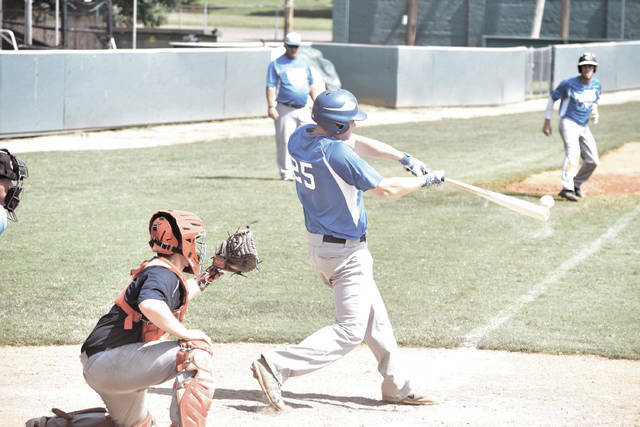 Then, following a Kimbler walk and a Brayden Davis flyout, Dyer and Gammon came up large at the most critical time once more as both players laced back-to-back RBI singles into left and right field, respectively, to score Shultz and Kimbler. Dyer was gunned down at the plate trying to score on Gammon’s base knock, but Post 23 had done its job at the plate as its 9-7 lead heading into the final half-frame indicated. 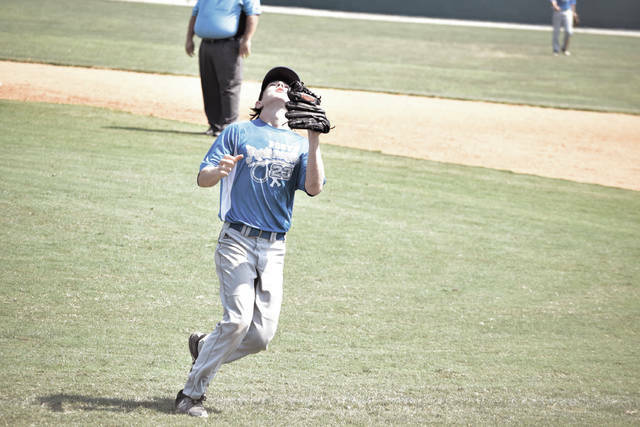 Even with an effective arm in Speas on the mound, Post 76 kept the outcome of the contest very much in doubt as a single by Hall, a hit by pitch, and an infield single by Austin Roe loaded the bases with two gone in the inning. Speas, however, induced Eastham into a right field flyout to collect the winning decision and put Post 23 in the GBBC Championship Game. In the championship game against Great Lakes, it was the Canadians who struck the board first as a single by leadoff hitter Kyle Maves, a stolen base, and two groundouts allowed Maves to score as GLC manufactured its way to a 1-0 lead after an inning of play. 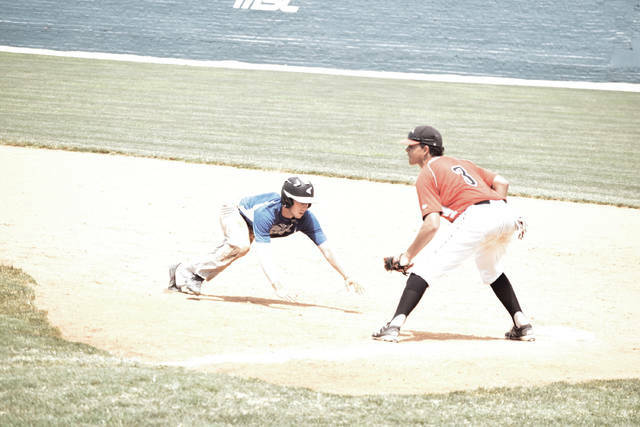 But down for only the second time over the entire course of the tournament, Post 23 arguably showed its very best qualities over the following two-and-a-half innings. After going down in order in the opening frame, Kimbler got the buzz started again with his two-out double to right field after staying alive in a seven-pitch at-bat. Two wild pitches — one to Davis and one to Dyer — then allowed Kimbler to knot the score at one apiece after three innings of work. In the fourth inning, Portsmouth really got the mojo working when Gammon, the outstanding do-it-all athlete, reached base by legging out an infield single. A Lauder walk and an excellent bunt by Lauder’s high school teammate, Shultz, loaded the bases for Will Darling and Jake Ashkettle, who kept them loaded by drawing a pair of walks that brought Gammon and Lauder home and extended the Post 23 lead to 3-1. Two batters later, a low throw ultimately resulted in an obstruction call at home plate, allowing Shultz to score as Portsmouth took a 4-1 lead after four innings of work. 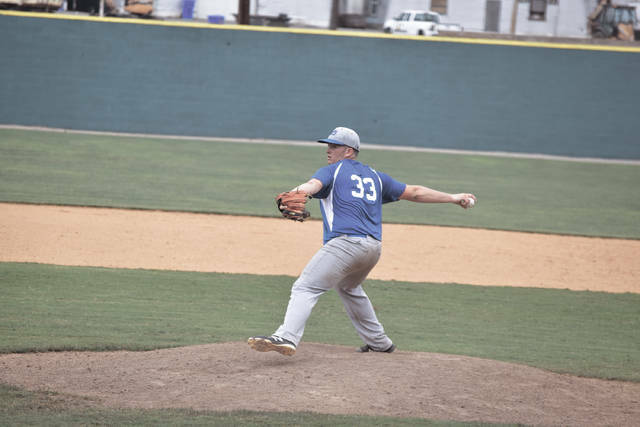 In his first appearance on the mound since returning to Florida on vacation, Lauder showed off the same special qualities that were familiar in Minford’s historical run. The senior-to-be posted another strong outing by throwing a complete game eight-hitter against a stacked Great Lakes lineup from top-to-bottom. However, an inning-ending double play on a fly out and throw out seemed to put a spark in the Canadians’ dugout, and in the bottom of the fourth inning, Great Lakes translated that momentum to the plate. Singles by Ian Jordan and Spencer Marcus were followed by a two-RBI double by Matt Jenkins, and just one batter later, Julio Vasquez’s single was bobbled in the outfield, which allowed Jenkins to come home to knot the score at four apiece. Lauder retired the next three batters he saw in succession, but Ryan Douglas worked four effective innings in relief of Eric Cerantola, and in the bottom of the sixth inning, a double by Vasquez, along with an error, allowed Stanley Dean to come through in the nine-hole with a base knock to left field to provide the go-ahead run that made all the difference. Even with the defeat, however, Post 23 made a memorable run that very few Portsmouth Post 23 teams can lay claim to — especially considering that Post 23 won six straight games, against top competition from across the United States, in temperatures that were well into the 90s.